Authors John Zehring and Kate Jagger bring their extensive fundraising experience to bear in this practical resource for churches. 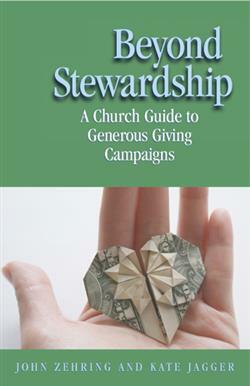 Beyond Stewardship applies the best principles of fundraising to the annual giving campaign in local congregations. Emphasizing the individual givers the act of giving as integral to spiritual life, this book goes beyond typical stewardship models to celebrate the generosity already demonstrated by church members and to invite further giving based on that generous past. Using a collaborative paradigm that engages leadership across the church, this volume offers four interlocking strategies for a successful annual giving campaign: concentric circles of commitment, personal visits, public witness, and direct mail. • Detailed roadmap for planning and executing annual giving campaigns. • Special section on raising funds for 'specific purposeœ campaigns. • Features a practical appendix of tools and resources. • Well-published author has written nine books and ten e-books on subjects including Christian living and leadership. Kate Jagger is an experienced fundraiser, chairing multiple annual giving campaigns for churches, schools, and community organizations. Previously, Kate worked in the publishing industry with Penguin Putnam Publishing in New York.